Definition at line 66 of file lltoolview.h. Definition at line 66 of file lltoolview.cpp. Definition at line 73 of file lltoolview.cpp. References LLLinkedList< DATA_TYPE >::deleteAllData(), and mContainList. Definition at line 79 of file lltoolview.cpp. References LLView::addChild(), LLLinkedList< DATA_TYPE >::addData(), FALSE, getButtonRect(), LLFontGL::getLineHeight(), LLResMgr::getRes(), LLRectBase< Type >::getWidth(), LLFontGL::getWidth(), gResMgr, llassert, llfloor(), LLFONT_SANSSERIF_SMALL, LLRectBase< Type >::mBottom, LLToolContainer::mButton, mButtonCount, mContainList, LLRectBase< Type >::mLeft, LLToolContainer::mPanel, LLToolContainer::mTool, onClickToolButton(), S32, LLPanel::setBackgroundVisible(), LLPanel::setBorderVisible(), LLRectBase< Type >::setLeftTopAndSize(), and LLFontGL::sSansSerif. Definition at line 151 of file lltoolview.cpp. References LLView::draw(), LLToolMgr::getCurrentToolset(), LLLinkedList< DATA_TYPE >::getFirstData(), LLLinkedList< DATA_TYPE >::getNextData(), LLToolset::getSelectedTool(), gToolMgr, mContainList, and NULL. Definition at line 174 of file lltoolview.cpp. References LLLinkedList< DATA_TYPE >::getFirstData(), LLLinkedList< DATA_TYPE >::getNextData(), llassert, llendl, llerrs, mContainList, and NULL. Definition at line 125 of file lltoolview.cpp. References LLView::getRect(), LLRectBase< Type >::getWidth(), HPAD, LLView::mRect, S32, LLRectBase< Type >::setLeftTopAndSize(), and VPAD. Definition at line 190 of file lltoolview.cpp. References LLToolMgr::getCurrentToolset(), gToolMgr, LLToolContainer::mTool, and LLToolset::selectTool(). Definition at line 89 of file lltoolview.h. 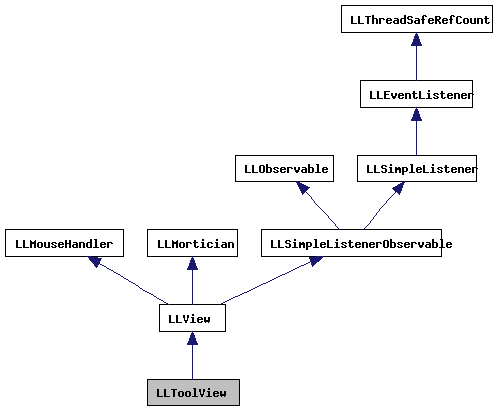 Definition at line 88 of file lltoolview.h. Referenced by addTool(), draw(), findToolContainer(), and ~LLToolView().